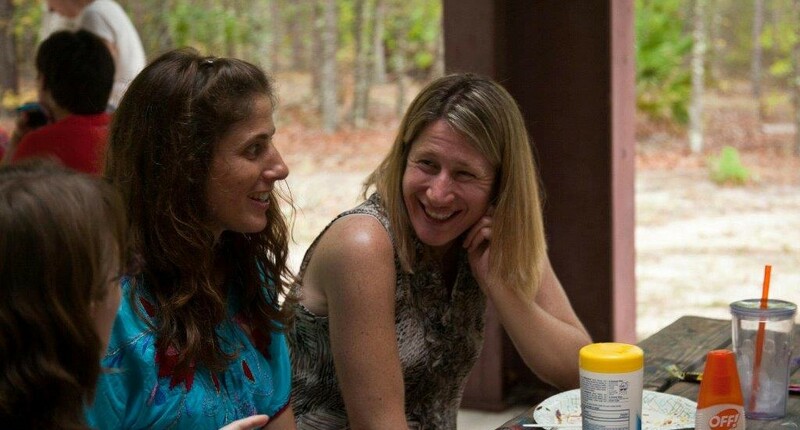 La Leche League of the Sunshine State cordially invites all Leaders and Leader Applicants to our 2016 Annual Family Retreat! Please join us at Luther Springs in Hawthorne, Florida from Friday, March 4th through Sunday, March 6th for a weekend of fun, friendship, and food! We are making our annual trek to beautiful and peaceful Luther Springs! The retreat center is set in central Florida about 30 miles east of Gainesville in the midst of 350 acres of mature woodlands, lakes and prairies. The waterfront area on Lake Vause is perfect for relaxing, fishing, canoeing and boating–with a fleet of canoes, paddle boats, two catamarans, and a pontoon available for water activities. There is also a swimming pool on site and it is another terrific place to relax, cool off and have fun! Hikers can trek through the pristine wooded areas and along natural marshland abundant with wildlife. Once again, we’re planning a community pot luck feast on Saturday evening to be followed by a roaring bonfire complete with roasted marshmallows and s’mores! There will be a limited amount of refrigerator space available for food storage as well as a microwave for reheating our culinary offerings. And–if swimming, hiking, boating, and eating aren’t enough for your crew, other fun, family activities will be offered throughout the weekend! Check back for details! Whether you choose to come with your family or decide to attend solo, you’ll find an abundant choice of activities at your fingertips. This is your weekend and your retreat, so feel free to do everything, or put your feet up and do nothing at all but listen to birdsong! From camping to cabins to motel-style rooms, there are over-night accommodations to suit everyone’s preference and pocketbook. The campground has both RV and tent sites. All 14 RV sites are equipped with water and electricity hookups: an RV dump station is conveniently located near the front of the camp. For tent campers, there are 10 primitive tent sites with centrally located water and nearby shower and toilet facilities. However, with 350 acres of of woodlands available to you, the possibilities for tent camping are endless–limited only by your desire for proximity to the shower house! A playground, picnic tables, cooking grills and fire rings are convenient to all designated campsites. The cabins feature sleeping accommodations for up to 11 people per unit in one twin and five sets of bunk beds. Each of the four cabins is also carpeted, heated and air-conditioned and has restroom and shower facilities. You can either choose to provide your own linens or they are available through the retreat center for an extra charge of $5 per person. One of the cabins will be set aside as a communal cabin for individual registrants; groups of six or more may reserve one of the other three cabins on a first come, first served basis for private occupancy. Motel rooms feature either two twins or one queen and a set of bunk beds , linens, and a private bath. As always, we are planning a community pot luck feast on Saturday evening, followed by a roaring bonfire complete with roasted marshmallows and s’mores! There will be a limited amount of refrigerator space available as well as a microwave for reheating our culinary offerings. And–if boating, hiking, and eating aren’t enough for your crew, other fun family activities will be offered throughout the weekend. More on that to follow! 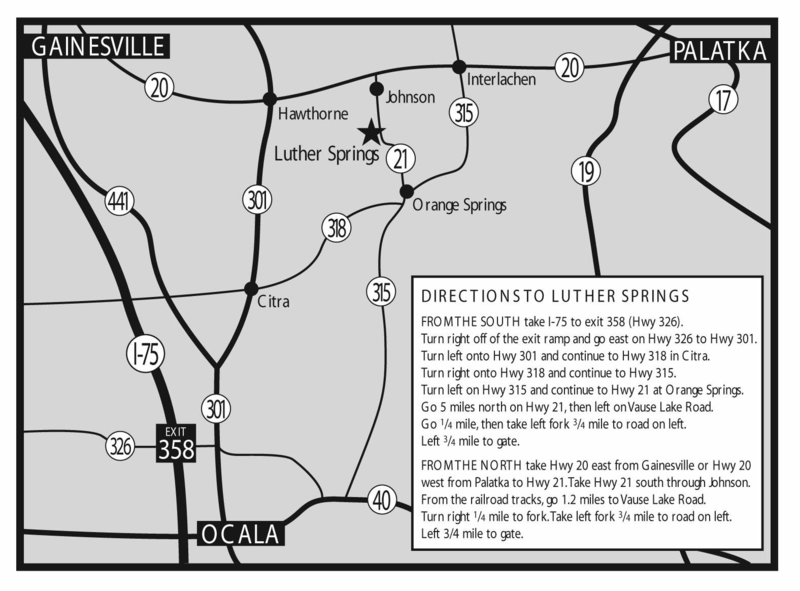 It is recommended that you do not rely on a GPS system for directions to the Luther Springs retreat center in Hawthorne, Florida, as there are several private roads that appear on the GPS system which are not accessible to public traffic, resulting in GPS users typically becoming lost! To download and print this map on a larger scale, click here. Registration is being handled by mail. Please download and print out the 2016 Retreat Registration Form and mail to our registrar at the address listed on the form. Contact Susan by phone (813) 237-6827 or email with retreat questions or to volunteer. Copyright © 2019 La Leche League of the Sunshine State All Rights Reserved.